Team USA has had a huge few days in Pyeongchang, raking in medals — most earned by women athletes. Each came with a personal milestone. One ended a longtime losing streak against Canada, and one ended a 42-year medal drought. U.S. women's hockey ended their Olympic losing streak against rival Canada Thursday, winning gold in an epic 3-2 shootout win. Jocelyne Lamoureux-Davidson pulled off an incredible deke in the sixth round, while Maddie Rooney closed the door on Meghan Agosta as the U.S. won gold for the first time since the 1998 Nagano Games. In Alpine skiing, Mikaela Shiffrin won silver in the women's Alpine combined, besting fellow American Lindsey Vonn, who went off course in the slalom portion and didn't finish that event. But Vonn kicked off the U.S. women's winning streak earlier, taking bronze in the women's downhill. At 33, she became the oldest female medalist in Alpine skiing at the Winter Games. "I wish I could keep going. I have so much fun. I love what I do," Vonn said after the downhill. "My body just can't, probably can't, take another four years." Vonn, the American comeback story of the games, waited eight years for a chance at another Olympic medal. She won gold and bronze in Vancouver but injuries and rehab prevented her from competing in Sochi. American snowboarder Jamie Anderson took home silver in the women's big air event. Anderson landed a frontside 1080 on her first run and a cab double cork 900 on her second run before falling on a cab double cork 1080 on her final attempt. The women’s speedskating team also came away with a bronze medal, ending Team USA's long track speedskating drought. No U.S. long track speedskater had won an Olympic medal since the men's team won silver in 2010, and no American woman speedskater has made the podium since Jennifer Rodriguez's bronze in the 1500m in Salt Lake City in 2002. Mia Manganello, Heather Bergsma and Brittany Bowe beat Canada by 0.45 seconds with a time of 2 minutes, 59.27 seconds. "I could barely see straight as we crossed the line so it took a second to register," Bergsma said. "It was like all the weight lifted off my shoulders. The medal has a special meaning to all three. Bowe and Bergsma both came up short in their individual races in Pyeongchang. And Bowe wasn't even sure she would make the Olympics. A year ago, she was experiencing post-concussion syndrome after colliding with a teammate during practice. She was in a "really dark place" after that. 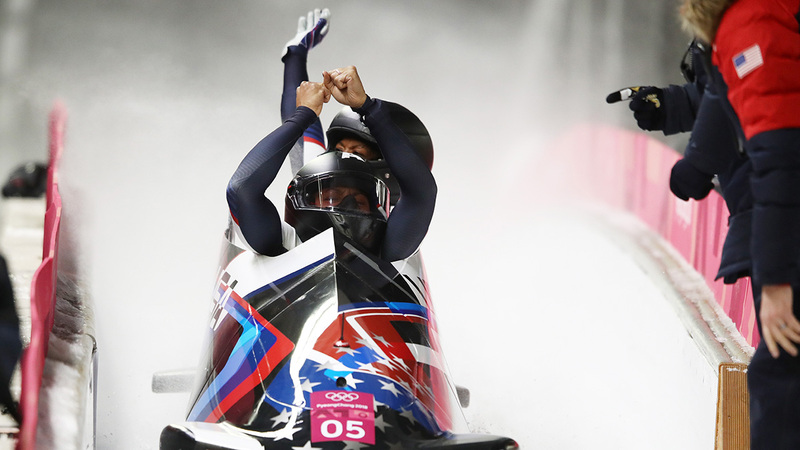 The silver medal went to the women's bobsledding duo of Elana Meyers Taylor and Lauren Gibbs. Meyers Taylor, who has dealt with an Achilles injury in Pyeongchang, matched the silver she earned in Sochi. In Pyeongchang she set her own course record and was really close to winning gold. In a thrilling final leg, Meyers Taylor had her best run of the games, but Germany's Mariama Jamanka Jamanka matched it, to give Germany yet another win on the Pyeongchang sliding course. "We came up short, but me and Lauren gave everything we had until the very last hundredth," Meyers Taylor said. "We won a silver medal." The American sled piloted by Jamie Greubel Poser with brakeman Aja Evans finished fifth, 0.13 seconds off the podium. The U.S. women's cross-country team not only won a gold medal, but they did it in historic fashion, ending a 42-year Olympic medal drought in cross-country skiing. Jessie Diggins and Kikkan Randall became the first American cross-country skiers to capture a gold medal by winning the women’s team sprint. 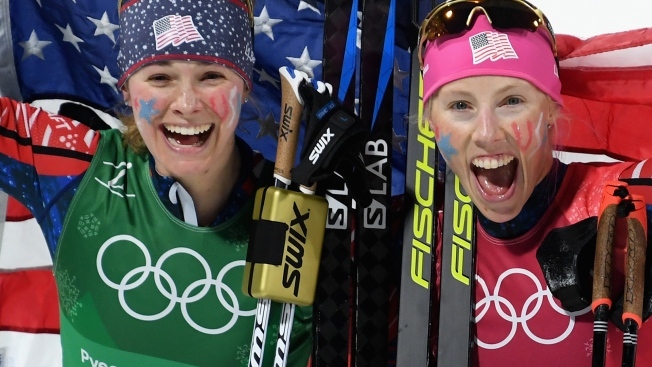 They're the first American women in cross-country skiing to medal at the games and join Bill Koch as the only American cross-country skiers to earn an Olympic medal. "That feeling of being able to cross the line and have Kikkan tackle me was the coolest thing ever," Diggins said. The recent medal-winning streak by U.S. women in Pyeongchang started on Tuesday with freestyle skier's Brita Sigourney's bronze in halfpipe and Maia Shibutani's bronze medal in ice dance, which she shared with her brother Alex. The "Shib Shibs" also helped the U.S. win the bronze in the figure skating team event. Of the 23 medals team USA has won at the games so far, 12 were earned by women athletes. Two more medals were won in mixed events. The U.S. sent 242 athletes to Pyeongchang for the Olympics to compete in all 15 disciplines across seven sports. Of that total, 134 were men and 108 women.